If you love being a retail travel sales consultant but you're ready for a new opportunity, we have the role for you. Right now, we are on the lookout for experienced travel consultants and sales consultants to join our wholesale brand - Infinity Holidays. As Flight Centre Travel Group's largest wholesale brand, Infinity Holidays provides each of our Flight Centre Travel Group customer facing businesses with the best deals available across a range of popular holiday destinations. 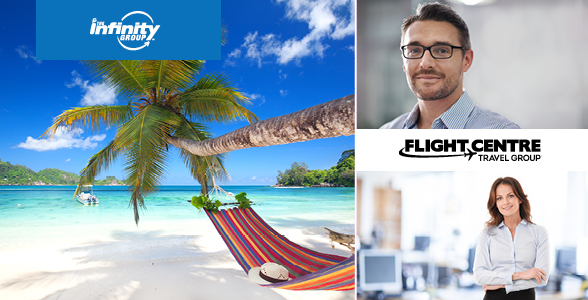 This varied and interesting role will involve working closely with Flight Centre Travel Group's travel sales consultants across each of our retail brands. You will assist the consultants to plan and book amazing products to ensure their clients' needs are met and expectations exceeded. You will be involved in all aspects of their clients' holiday bookings, including flights, accommodation, tours and activities and transfers with the aim of generating business for the organisation. The successful candidate will enjoy a remuneration package, comprising a base salary and generous commission structure. If this sounds like the right next step for you, apply today! As Flight Centre Travel Group's largest wholesale brand, Infinity Holidays provides each of our Flight Centre Travel Group customer facing businesses with the best deals available across a range of popular holiday destinations!